In today’s world, everyone wants to be their own boss. Since the last few years, you must have seen or heard the names of a lot of new companies. It’s great to follow your passion. But if you are working in a 9 to 5 job, then quitting a job immediately to launch your business can be a little risky. Thus, it’s always better to play safe. So, how to start a business without quitting your day job? Well, that’s why we are here to guide you on your entrepreneurial journey. Starting a business may sound excited but launching it and making it successful is a big challenge. The level of difficulty rise even more when you are planning to start a new business without quitting your day job. We are living in a world which is ruled by great business tycoons. Comparing with the big sharks is not easy. Any entrepreneur will guide you that launching a business requires a proper planning. During the initial period you may need to invest a lot of time. And managing everything while working for some other organization! Before you start a new business, make sure that you are not violating any moonlight or non-compete agreements. Even if you are not working on a contract basis check with your HR and re-examine your current company’s policies to ensure that you will not be dismissed for starting a business. If you don’t know about the legal obligations, take the help of the lawyer or ask our HR. Ask them questions such as if you can moonlight under your current contract or if it’s possible for you to start a part-time job from home. Since you are planning for your new business, it is important to evaluate both short-term and long-term goals. When we talk about goals here, we mean that you need to have a clear understanding on whether you want to continue to work for some other organization and keep this business as a part-time project or you will quit your current job soon after the business launch or develop. A comprehensive idea about it will give you clarity on how much time and money you should or need to invest in your new business. When asking how to start a business without quitting your day job, don’t forget to create a strong visual identity for your brand. Visual identities help in promoting products or services. A logo is a graphical representation of company’s products or services. It briefly explains the story of a brand. A logo can be created either in the form of image/symbol or text. Want to design a logo for your business? Use our logo maker tool. The tool help sits users to create a professional logo within minutes. Just like colors, typography also has the power to create an emotional connection with the audience. For instance, if you are planning to start a serious business then go with Comic Sans font type. But if you are planning to start a business which is fun and light-hearted then this font style may not be appropriate for you. Colors reflects the brand’s personality. They have the power to create an emotional connection with the audience. Using a consistent color palette throughout the website design and marketing materials will help audience in recognizing your brand easily. Make sure you choose the color that fits in your business logo design. During the initial stage, start with the larger groups. You can get more specific afterward. Segment your audience according to their age, gender, and location. You can also remove the irrelevant people from the list by using the same segment. There are very few entrepreneurs who come up with unique products. Though their business ideas may be unique and different, they will be part of the existing industries. You may also be one of them. Thus it is vital to do competitive analysis. Check the price, target customers, marketing campaigns, marketing materials, website of your competitors and plan your things accordingly. It is another great way to analyze the target audience. You may take online surveys, conduct one-to-one interviews and on the basis of that create your strategies. a. They are a great way to check the possibility of your business ideas. There are chances that at this point, you may discard your current business ideas and come up with something better. b. A realistic business plan will help you in attracting investors for your business. c. Business plan will give a clear picture of the market and industry, thus motivate you and your team to remain determined and focused. d. With the help of business plan, you will be able to prioritize your work to achieve your business goals. Though we are living in a digital era, that doesn’t mean we ignore the offline marketing techniques to promote business. Business cards are the most effective direct marketing tool. Want to get it design? Designhill is the world’s no. 1 graphic design platform where you get connected with freelance graphic designers from all around the world. In today’s digital world, almost half of the world’s population is using social media. Running contests, sharing creative visual content, providing social proof are some of the ways to do promotion and generate leads. Give your audience an exclusive preview of your products or services. Distribute free samples, showcase the details online, send a special invitation to test, etc. Don’t forget to take feedback. It will help you in gaining confidence and getting original content for your web page design. If you have planned to have a physical store for your business, then take advantage of it by doing in-store promotions for your business. Since you will be working for two jobs, it is very important to practice time management. Be clear in advance how many hours you are going to give to your new business? During what time of the day will you be handling most of your business work? It would be advisable not to work for your own business during your office hours, using office resources. Chances are you may get fired, if you get caught. Moreover, you may not be able to work on your own project with complete concentration. Use your time outside office to handle your workload when you are at your other job. Everyone start their own business to earn profits. In order to know the financial status of the business, keeping the details of expenses or investments are very important. The records will help you to stay away from the troubles of tax authorities, maintaining good relationships with clients and vendors. Since in the initial stage you may not afford to have an accountant for your business, it’s better to use personal finance software like Quicken, Mint, TurboTax, etc. You must be having professional connections. If you think that they can help you in your business, contact them. Meet them during your free time and introduce them to your business. You never know who may come out to be your potential customer or client. Or even they cannot prove to be beneficial for your business; you can exchange your business card and ask them to give them to their friends or family. Apart from making connections in your current office, you can also take the help of social media to get connected with potential customers or clients. In order to promote your business, you require the images for both online and offline marketing campaigns. Since you have just entered into the industry, you may not afford or think to hire a full-time graphic designer. Don’t worry! There are a lot of online marketplaces like Designhill from where you can hire a freelance professional graphic designer for your business. Working for two jobs at one time is not an easy task. There may come a time when you feel irritated due to workload. In such case, turn up to your close friends or family. Ask them to help you in balancing things. As discussed above, starting a business without quitting a day job is not easy. You may come to situations where you think to quit your dream. Thus, it is important to develop a self-care routine. Take out some time for some exercise or things you love to do. It will help you to stay physically and mentally healthy. 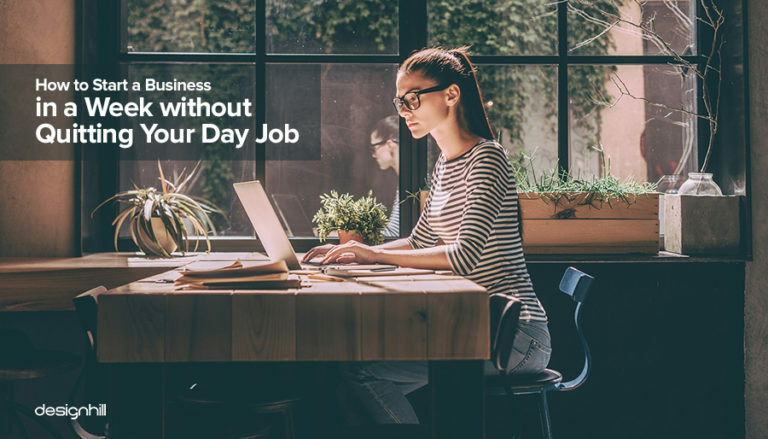 Since during your initial days, you will be operating your business from home, it is important to keep strict personal and professional boundaries. During your working hours, don’t allow anyone to just sit beside you or enter your working area (unless and until something is important). If on some days you cannot concentrate on your new business, go to some local coffee house to work. But that doesn’t mean you completely ignore your loved ones. Try to give them an appropriate time as well. Last, but not the least, be patient. Don’t expect to get success overnight. Give yourself and your business an appropriate time. With proper management and dedication you will certainly get successful with you business idea. Starting a new business may look very exciting, but the journey is not without a setback. And when you plan to start it without quitting your day job, the journey becomes more difficult. But that doesn’t mean one should stop chasing their dreams. Follow the above tips and start your entrepreneurial journey with full confidence and positivity. Good Luck! !